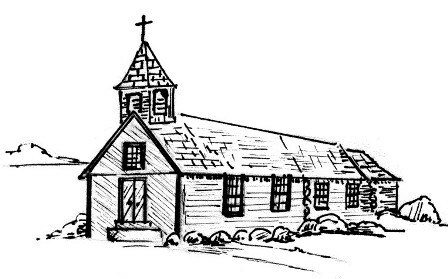 On June 20th, 1853, Father Adelbert Inama celebrated the first Mass in the newly erected log church of St. Francis Xavier in Cross Plains or Berry, as it was called at that time. Father Inama, a Norbertine Monk from Wilton in the Tyrol came to Sauk Prairie on November 25, 1845. 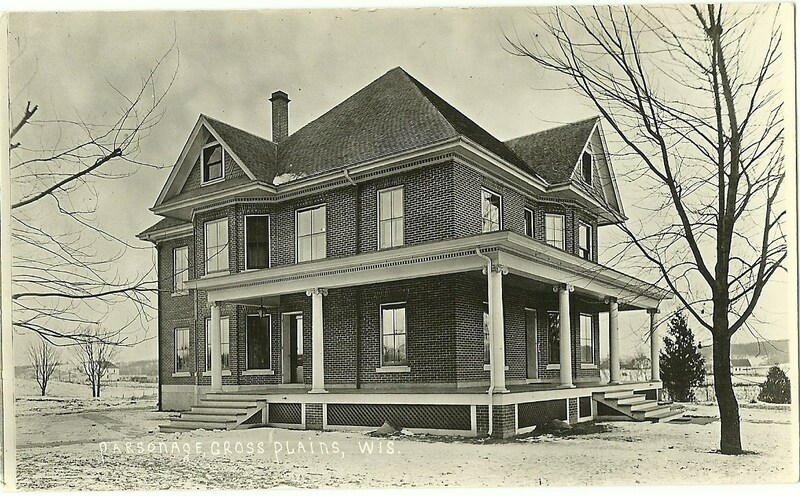 He settled near the Wisconsin River, between Roxbury and Sauk City. He had been doing missionary work in the East for several years when Bishop Johann Martin Henni of Milwaukee invited him to come to the Wisconsin territory. 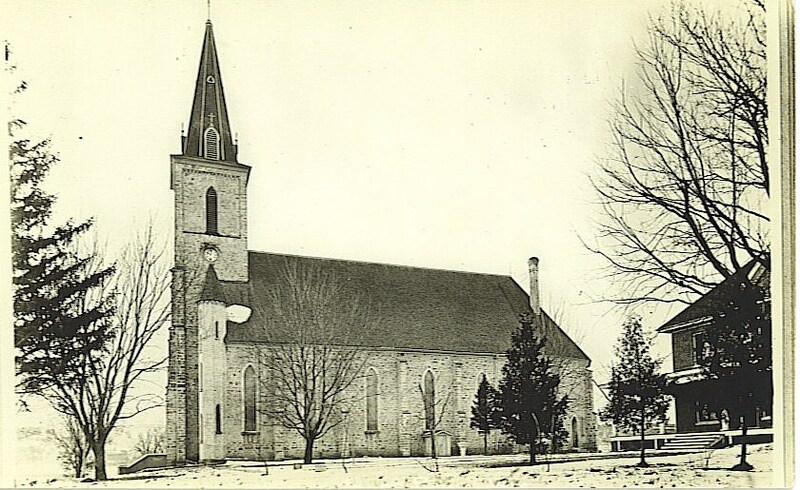 In a letter of February 14, 1853, Father Inama writes to his Bishop: “Seven miles south in the towns of Cross Plains and Middleton is situated a third mission district, consisting of thirty- three families, all of whom are farmers from Cologne, largely immigrants of last year. A benefactor has donated fifteen acres of land for a church and a priest, on which land the people have constructed a church this winter. They wish to have it ready for divine service by Easter, at which time I shall consecrate it. 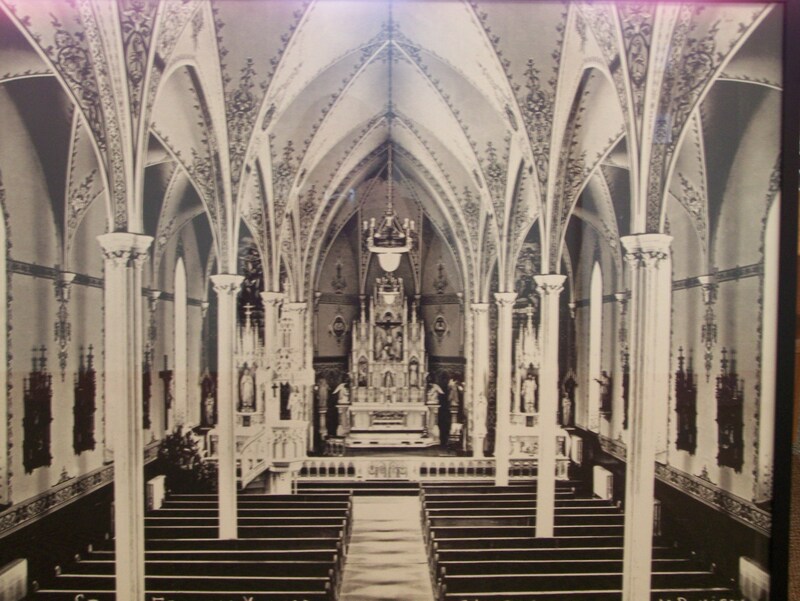 The community is in a state of lively development.” The third district, of which he wrote, is the present St. Francis Xavier and St. Mary’s of Pine Bluff. Interesting statistics about the church include that the shingles were hand-made and the mill work bought in Sauk City. It was 36 feet long and 20 feet wide, judging from the account book. The bare ground served as the floor until November of 1854. The ceiling was of open construction and left so until 1856. There were no pews. Sawed-off ends of logs served as seats until January, 1857, when they decided to install pews. This log and frame church was used until 1870. According to parish minutes, St. Francis Xavier School was established June 7, 1857. 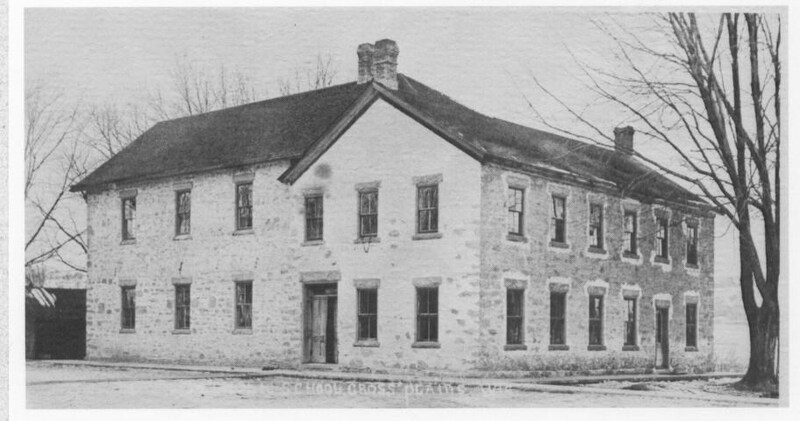 The first school was held in a building on neighboring property and was originally taught by a male teacher. The first one room school on parish property was built in 1859 at which time our first Sister was engaged to run the school. 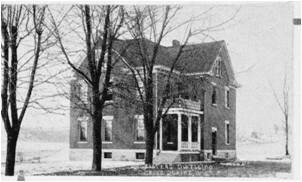 In 1866, a two story addition was added to provide an extra classroom and living quarters for the Sisters. The first parsonage, a temporary log structure, was built immediately upon the arrival of their first pastor, Father Conrad, in October, 1854. In the spring of 1855 a frame house was attached to it. A new school was built in 1924, a brick structure with four classrooms, an auditorium, and a basement, (now the cafeteria). In 1953, St. Francis Xavier celebrated the Centennial with a huge celebration in August. About 8,000 people came to Cross Plains that weekend. There were more than 50 priests and 45 nuns present. At the time of this celebration there were 275 families at St. Francis Xavier. In 1957 an addition was put on the school. The auditorium was made into four classrooms and a kitchen and gymnasium were added. On July 20, 1972 the parish encountered one of the darkest moments in its history. At 12:30 a.m. the Chief of Police awoke Sister Mariel Wozniak to tell her there was smoke coming from the church basement windows. At one point it was thought that the fire was under control but the fire had already spread into the walls and the ceiling. The fire chief ordered everyone out and the steeple collapsed at about 4:30 a.m. The firemen were able to save the convent and rectory. This fire left many a parishioner with a heavy heart filled with the memories of happy and sacred times in their church. The last use of the school gym as a church was on September 26th, 1974 when hundreds of parishioners gathered in the gym for the first part of the service and then processed to the new church to finish the Mass. The parish now numbered 350 families and the new church’s capacity would seat 500 people. In February of 1973, the remaining walls of the old church were razed and it was decided to build the new church on the same spot. Material shortages caused building delays, and actual rebuilding didn’t begin until December of 1973. In the meantime Sunday Masses and funerals were held in the school gym. On October 4, 1974 the cornerstone from the old church was placed near the new cornerstone which had the following items in it: melted glass from the old church windows and melted parts from the big bell; a video of the procession that took place in September when the first Mass was said in the new church; and the names of three children who were the first to be baptized in the church immediately after the laying of the cornerstones. On October 10, 1974 the congregation celebrated the completion of the construction of their new church. It was dedicated on November 3 by Bishop Cletus O’Donnell. In 1989, when the Notre Dame Sisters, Sister Joan Gmeinder and Sister Kyran Curtin left, the bottom floor of the convent, renamed the Pastoral Ministry Center, became offices for several of the Staff. In 2002, the rectory underwent a major overhaul. The original wood floors were restored. Upgrades in paint, shingles and interior were all undertaken. With the moving of parish offices from the rectory to our newly completed Catholic Ministry Center, many of the rooms were returned to their original intended use. On March 29, 2004, the convent, which had been renamed the Pastoral Ministry Center because it had been used for parish offices, was razed to make room for our new Catholic Ministry Center. To keep in touch with its roots, the original wood flooring from the convent was saved and placed in the waiting area and Pastor’s Office. In addition, brick from the exterior of the convent was also saved and makes up the wall directly behind the reception desk. A Catholic Ministry Center was built. This beautiful addition connects to our Church and contains the parish offices, a large fellowship hall and kitchen, conference rooms and an area used for funeral visitations. An open house celebrating the completion of this building was held on March 4, 2005. On May 1, 2006, an addition to the parking lot began on the 10 acres of land behind the Church, which was donated by Albert and Carrie Zander. An athletic field was also part of the project with the remaining land reserved for a future school site. St. Francis Xavier Catholic School serves students with a curriculum based in truth, justice, compassion, community and partnership. Our 160 year history of educating children in the faith has produced over 2,000 graduates, many of our which have gone on to be community leaders where they have settled.